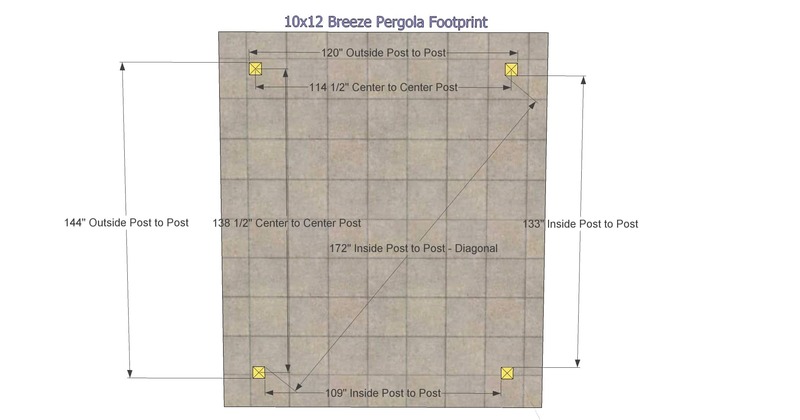 After a great deal of research, we ordered the Outdoor Living Today Breeze 10 x 12 Pergola Kit from Peaceful Patios, and we couldn’t be happier with our purchase. Allan at Peaceful Patios especially deserves a 5-star rating for the best customer service experience we’ve had in years. This is a pergola you'll love, and a company you can trust. Clearly, Peaceful Patios has chosen its product well. The OLT Breeze pergola is beautifully and solidly constructed from western red cedar. The boards were straight, making it easy to work with, and the engineered posts were even stronger than expected. The edges on all of the pieces were smooth, which made a nice finished look. 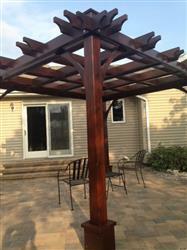 Prior to assembly, we chose to stain our pergola a deep mahogany ourselves (Cabot Gold Moonlight Mahogany, to be exact), which took a larger part of a holiday weekend, but well worth it. The quality cedar took the stain beautifully in the recommended two coats. Assembly took only one day with two people with years of DIY projects between them. The instructions were easy to read, but for those with less carpentry experience, markings on the boards for each screw location would be helpful. One person could complete much of the assembly on the ground, but raising the posts, squaring the structure, and raising the ladder-like sections of the roof into place would be difficult without two people. 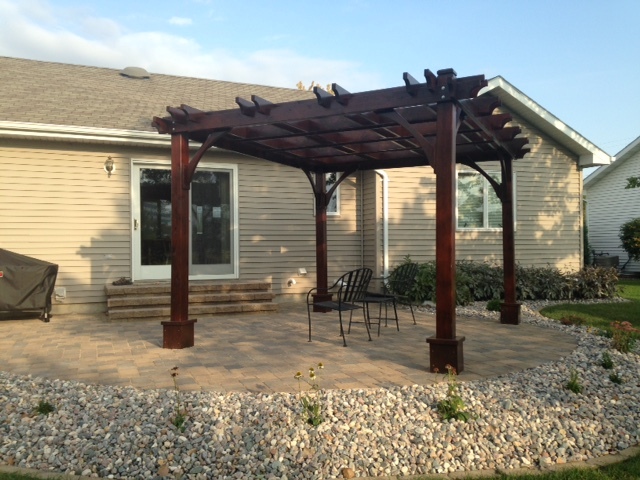 We secured our pergola to poured footings integrated into our new paver stone patio design by using the recommendations on the manufacturer’s website and the mounting hardware available with the pergola (not included in the price of the pergola). It is worth noting that in planning footings, one needs to account for the slope of the patio and depth of the paver stones when calculating the desired finished height of the pergola structure. Peaceful Patios provided great customer service and seems to partner with those who understand the value of this. 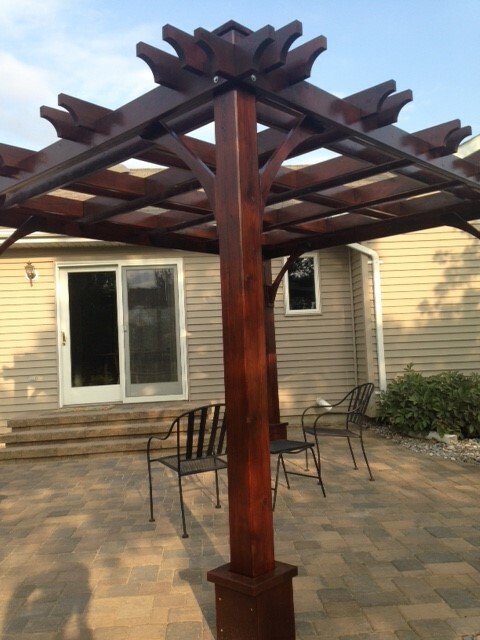 We received calls from both the manufacturer and the delivery company to make sure the pergola would arrive safely at a time convenient to us. 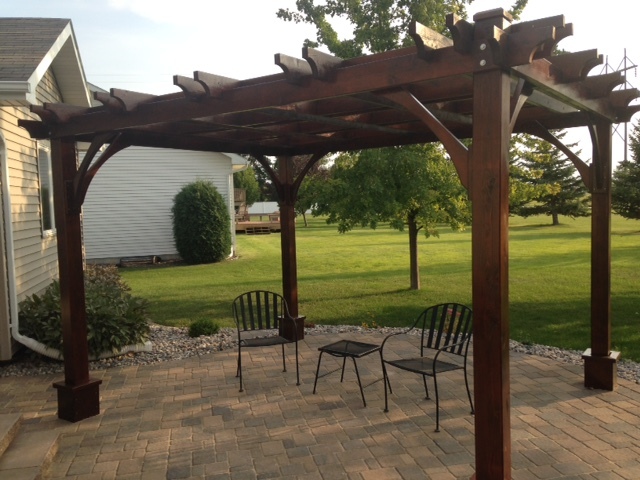 The pergola pieces arrived on a pallet that was, to use the delivery driver’s words, “extremely well-packaged and protected.” Allan at Peaceful Patios rightly advised us to select the option to unload the pieces ourselves upon delivery, which saved us $100. But, the real evidence of the helpfulness of Peaceful Patios came when, through a fluke of timing, tariffs unexpectedly raised the price of our pergola. Instead of going through with the order and simply tacking on the extra cost, Allan cancelled our order, refunded our money, and contacted us personally by both email and phone immediately to explain what had happened and discuss our options. Allan then quickly worked with the manufacturer to get a new quote. Ultimately Peaceful Patios was able to secure our order at only a slightly higher cost than originally listed and still lower than other companies we’d researched. For the delay, Peaceful Patios provided the mounting hardware for the footings free of charge. While their attitude about something well beyond their control could have been “sorry, that’s business,” Peaceful Patios chose to risk losing a sale in order to do the right thing. We wish more companies showed such consideration and integrity. Our pergola has already drawn the admiration of neighbors, and we do not hesitate to recommend both the pergola and Peaceful Patios to them.